Situated in a non exit street, overlooking Long Beach and out across the Bay of Islands. The cottage is almost hidden from the road in established native trees, which add to the privacy. Only when you get inside, or around the front of the house do you then see the wow factor. The view is just fabulous! Whether it be from inside the house, the top deck which features an outdoor table, and BBQ on the lower deck also having a small table, if you wish a little space to yourself. The house is all on one level, with the living room, kitchen and dining area are all open plan, all with views across the Bay of Islands. The bathroom with a shower, toilet and vanity also contains a washing machine and dryer. From the large private deck looking over the bay to the Islands, you may catch a sight of dolphins, occasionally whales, and many boats. Below is Long Beach, a wonderfully safe sandy swimming or walking beach. This home is only 10 minutes walk down into the village for eateries or the Wharf. 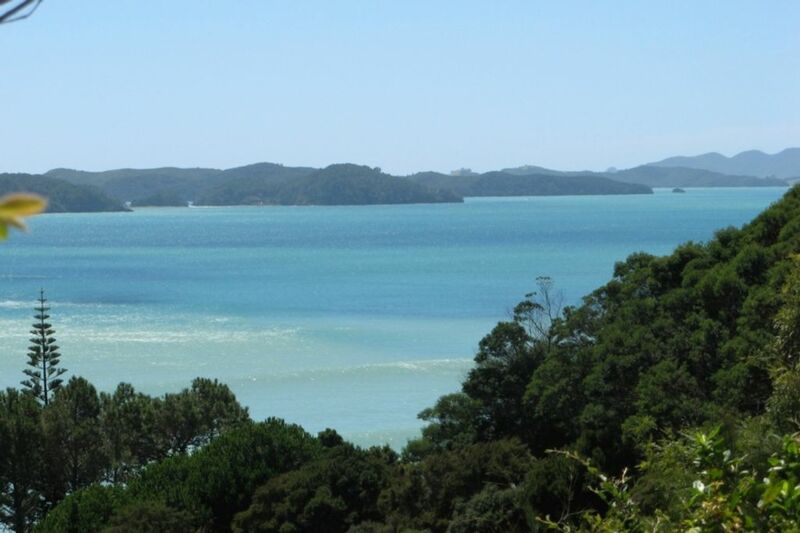 Take a boat trip to catch fish, take in some sightseeing or perhaps to visit Paihia for some more shopping. Also this is a great home from which to explore Russell and the wider Bay of Islands with plenty of land or sea activities for everyone. SPA POOL: There is an additional charge for use of the spa pool of $85.00 per stay. We change the water after each guests stay to ensure that hygiene levels are kept to the highest possible standard. Hi David, Thanks for the lovely review, we are pleased that you enjoyed your stay at Sunrise View. Wishing you a safe return home, you are welcome back anytime, take care. Cosy property, with a lovely view. Cosy property, with a lovely view. Beds comfortable, everything there to make your stay easy. MInor detail would be water pressure in the shower - not too good, however not sure if anything can be done about that. Certainly not enough of a priority to put you off the house!! A beautiful Bach with spectacular views and inviting hot tub! Perfectly quiet for a perfect escape. Fantastic, home away from home but with the most awesome view. Great location for the beach, few things were missing when we arrived but Barry and Lesley sorted them asap. Super little Bach! The veiw was spectacular and the spa a welcome way to relax after exploring the local sights. The veiw was spectacular and the spa a welcome way to relax after exploring the local sights. We thorougly enjoyed our stay.